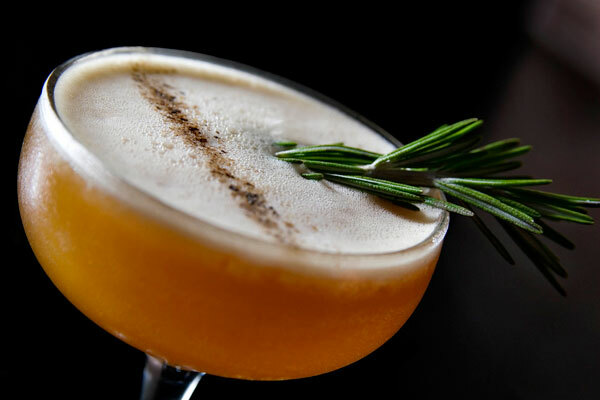 An ideal cocktail for holiday entertaining, Rosemary Orange is simple and accessible. Find out what tools and techniques are used to make an aromatic and delicious. Discover other holiday cocktails in our collection of original recipes from the top bartenders across the nation. Rip off all leaves from one of the rosemary sprigs and place all ingredients in shaker tin. Using a pestle, muddle all components. Add ice, shake until chilled and fine strain into a cocktail glass. Garnish with piece of rosemary approximately 4 inches in length and one very thin line of ground black pepper. Winner of numerous mixology and barchef competitions, Frankie Solarik has been credited with being the pioneer of the barchef movement in Canada. Having appeared in numerous TV and publications (Food Network, BNN, CBC, Toronto Life, Toronto Star, and National Post) his direction and complex flavor compositions with his cocktails involving very precise and mathematical techniques has won him international acclaim. He has recently developed a passion for the modern molecular movement. His ambition behind each drink is the mis-direction of the senses in a way that one thing is perceived and a completely different experience follows.